Yup, Ozone's still the greatest software mastering system money can buy. The Advanced version rules, and the standard version is an absolute bargain. Slick new interface. Superb all-in-one mastering solution. Improved EQ options. New Dynamic EQ in Advanced version. Seriously powerful standard version. Decently equipped standalone option. Only six module slots. Preset system could be more flexible. iZotope's hugely popular all-in-one mastering package (VST/VST3/AAX/AU) comprises a chain of multiband dynamics, EQ and other processors with integrated spectrum analysis and iZotope's MBIT+ dither. It comes in Standard and Advanced versions. Version 6 retains most of Ozone's established features, such as stereo, mid/side and left/right operation, undo with history, and clear graphical feedback of levels, frequency spectrum and processing (applied EQ curves, etc). The core technologies still include an adjustable dynamics detection filter, dynamics parallel processing, matching EQ mode, analogue and digital EQ phase response (with fully adjustable phase for the latter), and an EQ frequency pinpointing system called Alt-Solo, which auditions the frequency band below the mouse pointer in the Spectrum display. Other Ozone mainstays include the Maximiser, with its Intelligent Release Control, the 4-band stereo image adjuster (Imager) and the 4-band harmonic Exciter. "Ozone 6 delivers both precise and sweetening EQ, subtle or audible dynamic control, state-of-the- art loudness maximising, and 'fairy dust' extras"
The Ozone 6 GUI introduces a whole new design, and although the positional layout is much like that of version 5, everything looks and feels very different. The partially adjustable signal flow of version 5 has been replaced and enhanced by a six-slot modular setup in which each module can be freely repositioned or removed. On the processing front, Ozone 5's Reverb has been axed, but there's a new addition in the shape of Dynamic EQ (Advanced only), so Ozone's seven modules now consist of Exciter, Dynamics, Dynamic EQ, Imager, Equalizer, Post Equalizer and Maximiser. Each module can be used only once, but the two EQs, although named differently, are functionally identical, enabling comprehensive 8-band frequency- shaping at two points in the processing chain. There are four new EQ modes - Baxandall and Resonant Shelves, Proportional Q and Band Shelf Bells - amounting to an awesome selection of filter shapes. Modules also now deliver seamless (ie, click-free) bypassing, and feature Gain Stage Metering on the Module tabs themselves, making all gain changes visible at a glance. Previous versions of Ozone have only come in plugin form, but Ozone 6 includes a standalone version with some nifty functionality of its own. Multiple files (in WAV, AIFF and MP3 formats) can be loaded into the tabbed workspace along the top, where they can be topped and tailed, and faded in and out. There's also the option to load external VST/AU plugins into any of the six Module slots. These are chosen from a list (categorised by manufacturer), and appear in floating windows when opened for editing. The current workspace can be saved as an Ozone Project, incorporating your imported audio, exported audio and settings within one folder. When you're done, you can export either the selected track or all tracks from the workspace. Audio quality can be set to 16-, 24- and 32-bit, with sample rates from 11,025Hz to 192kHz. As expected, the vast majority of Ozone 6's features are identical to those of version 5, delivering both precise and sweetening EQ, subtle or audible dynamic control, state-of-the- art loudness maximising, and 'fairy dust' extras such as stereo image adjustment and harmonic enhancement. However, Ozone 5 was also peppered with dropdown menus and buried options, and you'll soon notice - and appreciate - that version 6 brings some of these to the foreground. 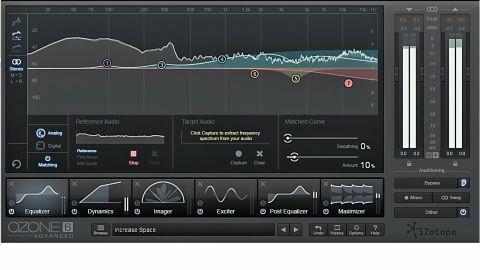 "Ozone 6 is slicker and more flexible than its predecessor"
Two examples are Surgical EQ (now readily visible in the EQ window), which, at higher Q settings, provides very angular, precise EQing; and bypass Auto-Match Gain (now activated using the 'ear' icon in the Audition section), which modifies the bypass gain to provide more effective A/Bing. Also from version 5, Matching EQ now has much clearer controls and is much easier to use. Dynamic EQ is the headline new feature in Ozone 6, and it doesn't disappoint. You get four bands of volume-sensitive EQ with five filter shapes (Baxandall Bass, Band Shelf, Peak Bell, Proportional Q and Baxandall Treble). Exceeding the threshold results in the filter applying gain reduction, ie, a cut; there's also an Inverse Mode that applies a boost instead. In addition to its dynamic action, each band can apply a static boost or cut, so there's a good deal of flexibility on offer. Attack and release times can be set manually, or you can use the Auto Scale function, which sets them to suit the selected frequency. The excellent Alt-Solo option is still available, of course, which helps pinpoint frequencies. In fact, the only thing missing from Dynamic EQ, we say, is the ability to offset the detection and processing frequencies. V6 includes over 50 presets for the full multi- module plugin, now categorised by processing strength (Balanced, Heavy or Light). Ozone 6 Advanced users also get individual plugin presets, although, alas, in the interests of simplicity, you can't access individual Module presets within the main plugin. Also moderately frustrating - but totally by design, we're told, in order to save UI space - is the fact that Advanced owners have access to seven Modules but only six slots in which to load them. Weird! These are minor niggles, though, and ultimately, Ozone 6 is slicker and more flexible than its predecessor, with the seriously equipped yet eminently affordable regular option giving those who can't afford the full Advanced package no real reason to feel like second class citizens. In a word, brilliant.